At Triple M Recreation we love our customers! 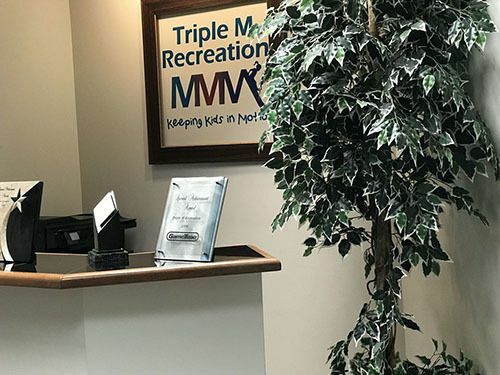 Gene Everts, Principal, is the founder of Triple M Recreation and has over 29 years of experience working in the recreational business, specifically with GameTime. His experience and love of the industry have provided a strong, stable and successful culture at Triple M Recreation. Patti Everts, President, has 22 years of sales, sales management and marketing experience. Patti oversees the Sales department, Customer service department, accounting department and the operations/clerical staff. Doug Johannsen, CPSI, has been responsible for sales in Colorado for the last 10 years and holds the title of Senior Field Representative and Project Manager. Doug is a Certified Playground Safety Inspector and oversees all aspects of the sales process including site visits before, during and after project is complete. Ron Romero, CPSI, has been responsible for the sales in New Mexico for the last 3 years and holds the title of a Field Representative and Project Manager. Ron is a Certified Playground Safety Inspector and oversees all aspects of the sales process including site visits before, during and after the project is complete. In the past, Ron has worked as the General Manager for a local concrete company having 20 years experience and is a native of New Mexico. Pete Ryan, Field Representative and Project Manager for the state of Arizona. Pete comes to Triple M Recreation with a strong background in sales development, customer relations and strategic planning. Pete is a graduate of the University of Arizona, Tucson. Peter Kubacki, CPSI Bid Estimator, designer, CAD operator and compliance officer, has 20 years of experience in the industry. He is responsible for transforming initial rough product designs using computer-aided design (CAD) into working documents. Reviews engineering drawings and designs to ensure adherence to established specifications and standards. Peter also oversees that all designs conform to the standard, ASTM F1487-01, the Standard Consumer Safety Performance Specification for Playground Equipment for Public Use and the Consumer Product Safety Commission. Karina Macias, Project Coordinator, specializes in project management. She is responsible for a number of operational functions such as quotes, CAD design and customer service. Janeil Norman, Controller, Has 2 years experience in accounting and financial operations of the company, to include invoicing, accounts receivable, accounts payable, payroll, and all tax related tasks. Cassie Crider, Executive Assistance. Cassie is responsible for a number of operational tasks including customer service, office management and assisting the company president. Jessica Wadley, Order Entry Manager, has over 7 years experience in Customer Service with a strong background in problem resolution and superior organizational skills. Is responsible for all order entry processes and oversees the department.